The Gunpowder River is flowing at 106 Cfs is 53.5 F and gin clear. Fish are looking up for caddis and flying ants. Tricos are just starting at Masemore. Long leaders and 7x are a safe bet. Fish are holding in the shade. Terrestrials like Shenk’s hoppers and crickets are worth a look. Pheasant tails followed by a midge or midge larva pattern are a nice way to cover the riffles. 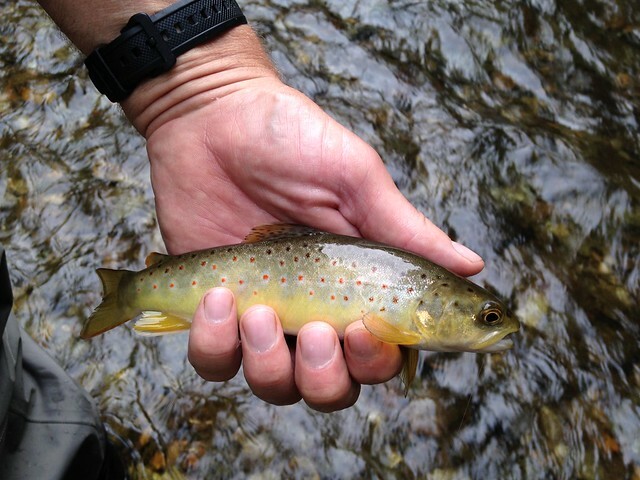 Thanks to Josh for the pics of wild browns. 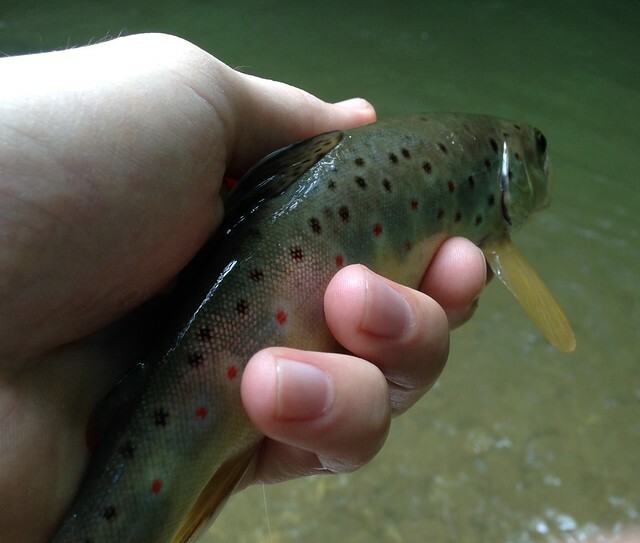 This entry was posted in fishing report on July 17, 2014 by Theaux Le Gardeur. Please join us for a fly fishing school. 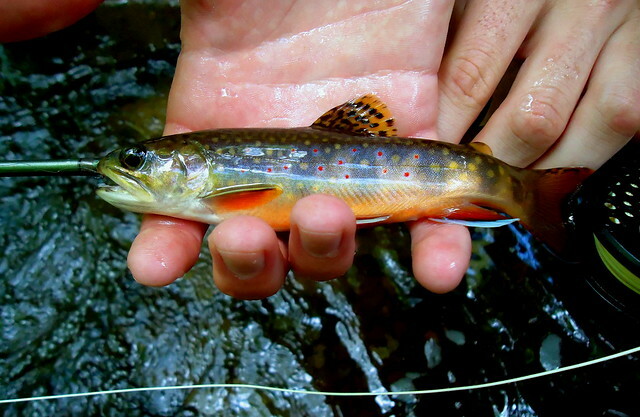 On Sunday, July 13th, a Backwater Angler Guide will be teaching a fly fishing school that is ideal for beginners. If you’re planning on flyfishing Maryland, or anywhere else for that matter, this course is a great introduction to the sport. The school covers knots, casting, gear and fly selection. Class is held from 10:00 AM till 1:00 PM. Cost is $125 per person and includes the use of gear. A Maryland non-tidal fishing license and trout stamp is required and may be purchased at the shop with check or cash the day of the school. Class size is limited to 4 and pre-registration is required. Please give us a call at 410-357-9557 to pre-register. This entry was posted in events on July 8, 2014 by Theaux Le Gardeur. Please join us for a fly fishing school. On Saturday, July 12, a Backwater Angler Guide will be teaching a fly fishing school that is ideal for beginners. If you’re planning on flyfishing Maryland, or anywhere else for that matter, this course is a great introduction to the sport. The school covers knots, casting, gear and fly selection. Class is held from 11:00 AM till 2:00 PM. Cost is $125 per person and includes the use of gear. A Maryland non-tidal fishing license and trout stamp is required and may be purchased at the shop with check or cash the day of the school. Class size is limited to 4 and pre-registration is required. Please give us a call at 410-357-9557 to pre-register. The Gunpowder River is flowing at 106 Cfs is 52f and clear above Masemore Rd access. While the shop will be closed on the 4th, it will be open this Saturday and Sunday. The 4th is the last free fishing day in Maryland this year so be sure to take advantage of it. With cooler weather ahead, plan on a few Blue Winged Olives early. River temperatures have moderated a bit and are now starting in the low 50’s. Unless you’re planning on nymphing–sleep in, eat a hearty breakfast and get out on the River as it is warming up.The Sulphurs are all but gone and caddis are a good bet. We’re also seeing a few ants and beetles making their way into the stream. Long leaders are still the trick. Typically as the water drops mid-summer a 10 foot leader in 5x is a good starting point-add some 6 and/or 7x and you’ll be in the game. Think short cast, long drift and you’ll be on the right track. This shot of a native Brookie Josh Reider released just across the border was too pretty to leave archived as it would give even the best fireworks display a run for the money. Have a safe 4th! 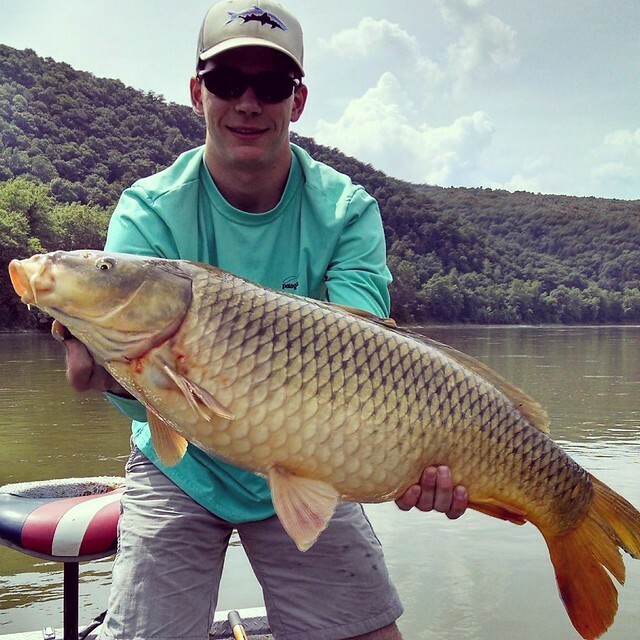 This entry was posted in fishing report on July 3, 2014 by Theaux Le Gardeur.